Recently, the Backpack South America Facebook Page received a message from traveller Diana Muñoz. 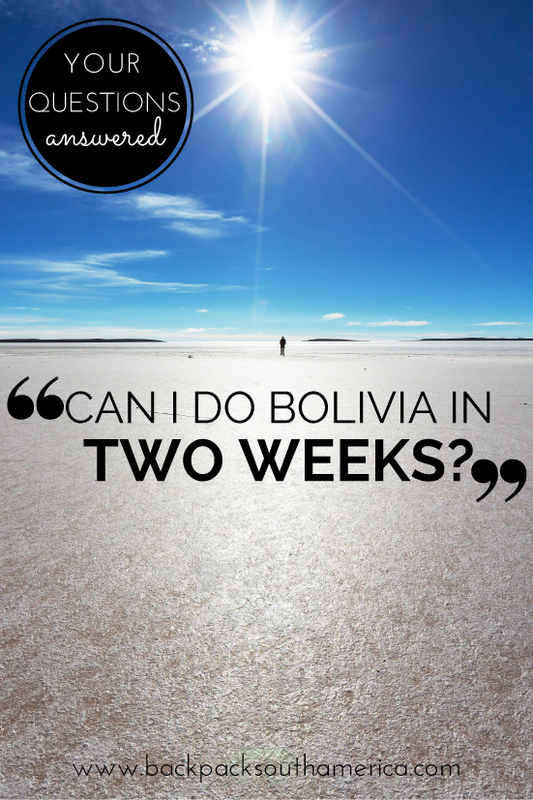 She’s about to embark on a trip to Bolivia and had a few questions for us, and since I thought the answers would help other travellers I decided to create a post about it. She is travelling from Argentina by train from Villazón to Potosí. She wants to see Potosí, Uyuní, Sucre, La Paz and Copacabana – before heading into Peru via Puno. She plans to travel by bus. Is it Easy to Go to Uyuní from Potosí? It’s definitely very easy to get from Potosí to Uyuní. I didn’t travel that route myself, as I went from Potosí to Tupiza, and from there took the four day jeep tour to Salar de Uyuní, ending in Uyuní. But, when I was in the bus station at Potosí booking my tickets to Tupiza, there were lots of different bus companies offering tickets to Uyuní – as this is the standard “backpacker route”. There were several buses from Potosí to Uyuní everyday, and the journey only takes around 4 hours by bus. Tickets seem to cost around 30 Bs (about $4.30 of £2.70). Bus tickets can only be booked directly at the bus station, which is on the edge of the Potosí. Most buses seemed to leave pretty early when I was there (in May this year), so Diana might find it easier it going to the station the day before she travels to book tickets and check bus times – otherwise I would recommend that she aims to arrive at the station for about 8am. Most travellers are in agreement that there is “nothing” to do in Potosí besides the mine tour. Whilst I never like to say that you only need X amount of time in a place, as everyone’s experiences are different, I will confess that there isn’t much in Potosí to tempt travellers to stay longer than a night. The mine tour itself is an eye-opening, but quite horrific, experience; the mines are small and cramped, and the air is heavy with dust, so anyone with fitness/breathing problems or claustrophobia, should avoid the tours altogether. The experience is fairly voyeuristic, witnessing poverty first-hand and watching real-life workers in pretty miserable and dangerous situations, so if you think it will upset you, I would not recommend this tour; truthfully, I wish I had never done it. If Diana is planning to do the mine tour, these take place twice a day, leaving either around 8am or 12pm. Depending on what time she arrives, she can either take the 12pm tour that day, or stay the night in a hostel and take the 8am tour before taking an afternoon bus to Uyuní (which she should definitely book the day before). If not, I would say that a few hours in Potosí would be enough to have a look around – I recommend visiting the miner’s market and the Miner’s Memorial – before jumping on a bus to Uyuní. My Hostel Recommendation for Potosí: Hostal Koala Den. It has a lovely quiet atmosphere, and they can arrange mine tours for guests with Koala Tours. The hostel is cheap, well heated (important in Potosí, which is cold at night) and cosy – plus breakfast is very filling and varied! Would you recommend to do Uyuni in just one day, or should I stay a night? Once again, apart from the Salt Flats and the train cemetery, there really isn’t much else to do or see in Uyuni. – especially someone without much time in the country. There are one day tours you can do which will see both in one day, like the one offered by Red Planet. I didn’t do my tour with Red Planet as they don’t offer the Tupiza-Uyuní tour, but they were highly recommended to me by a few other travellers. If Diana does choose to take the one day tour, I wouldn’t recommend for her to stay the night in town unless she finds that she can’t take a bus till the next day (this shouldn’t be the case, as I believe there is a night bus from Uyuni to Sucre). There aren’t many hostels in Uyuni and there’s not much to do, as other travellers tend only to ‘pass through’ on the way to the Salar de Uyuni tour. Personally, I’d recommend that Diana take the traditional two night jeep tour if she can squeeze it into her trip. She’ll see a lot of the country and it’s a really fun tour – the tours visit lakes, rock formations, mountains, geysers and hot springs before finishing at the Salar de Uyuni and the Train Cemetery. Sucre is a gorgeous city, painted almost entirely white, and although its the capital of Bolivia it’s actually a lot quieter and less crazy that La Paz. Lots of travellers flock here to take advantage of the incredibly cheap Spanish lessons (read more about Learning Spanish in Bolivia here), resulting in the relaxing, studious atmosphere which makes Sucre a great place to spend a couple of days chilling out. Whilst there, Diana should definitely visit the incredible central market – and try the amazing hot sandwiches and fruit smoothies on sale there. If she has time, I’d also recommend a day trip the the stunning Siete Cascadas just outside the city, a series of seven waterfalls which are worth the tricky hour long hike to reach them – she can even swim in the natural pools if she can brave the cold water! A drink at the Cafe Gourmet Mirador on La Recoleta hill to watch the sunset is also highly recommended. If she has time, Diana may also enjoy a trek from Sucre to the Maragua Crater. The trek can be done over one, two or three days with many tour companies, and is highly enjoyable and only moderately challenging. The scenery is incredible, and she’ll even be able to spot dinosaur footprints, as well as heaps of local flora and fauna, along the way. My Hostel Recommendation for Sucre: The Celtic Cross. It’s quiet and welcoming, with a lovely central courtyard, a really friendly Irish expat owner, and a fabulous roof terrace to watch the sunsets over the white city. La Paz, the unffocial capital of Bolivia, is an enormous, sprawling and crazy city, surrounded by misty mountains and packed full of interesting sites and fascinating culture and history. Diana could easily spend several days here, but I’d recommend at least three to see as much as possible. She should not miss a trip to the Mercado de las Brujas (witch’s market), and the free walking tour with Red Caps is absolutely amazing – the best way to see as much of the city as possible and learn all about it’s most interesting quirks, like the insane San Pedro prison. If she’s feeling daring, Diana may also fancy abseiling or Australian rapelling (face first) down a 17 storey building with Urban Rush – it was one of my favourite experiences in Bolivia! If she has more time in the city, Diana may want to trek one of the nearby mountains, or take a day trip to cycle Death Road – a very dangerous and very high gravel road curling along the side of a mountain. Although scary, the road is a popular ‘rite of passage’ for many travellers and is actually a very fun day out. I highly recommend Altitude for the Death Road tour, as they were a really good company and very safety conscious, with decent equipment. My Hostel Recommendation for La Paz: I stayed in the Wild Rover, an Irish party hostel which is always crowded and has crazy, loud parties every night. I’m not much of a party backpacker, but the bar is good, and the hostel is clean and friendly. Request a room far away from the bar, though, or you won’t get any sleep! Copacabana is a small town on the shore of Lake Titicaca, the highest navigable lake in the world. The town itself is small and quiet, with just a handful of hotels, bars and restaurants, but a walk along the shore of the stunningly blue Lake Titicaca is an absolute joy. While Diana is in Copacabana, I’d really recommend spending one or two nights on the Isla del Sol. Copacabana itself doesn’t have much to see, but you can take a boat to the Isla del Sol (about an hour and a half) and spend a night there. It’s a small island – you can walk from one end to another in about an hour – and there are some Inca ruins there and really pretty landscapes. At night, the sky is so clear that you can see thousands of stars, and sometimes even the milky way, and sunsets/sunrises from the highest hill on the Isla are absolutely stunning. If it’s warm weather there are also beaches around the island – so Diana can swim in Laka Titicaca if she fancies braving the cold water! I really recommend the tiny restaurant Las Velas, which is set on the edge of a pine forest next to the village of Yumani in the South of the island. The food is incredible, and although there’s usually a long wait it’s well worth it. The chef is lovely, the dining room is dimly lit by about six candles, and there’s a cosy, homely atmosphere – plus after dinner the restaurant is on the perfect point for some star-gazing, and the chef is more than happy to point out some constellations for you. My Hostel Recommendation for Isla del Sol: The Templo del Sol in Yumani, simply because it’s one of the cheapest hotels in the village. We paid about 30 Bs (roughly £6 GBP) for a double room. Day One – Arrive Potosí in the afternoon. Book the bus tickets for tomorrow. Day Two – 8am mine tour. Afternoon bus to Uyuni. Day Three – Three Day Salar de Uyuni Tour. Day Four – Three Day Salar de Uyuni Tour. Day Five – Three Day Salar de Uyuni Tour. Afternoon bus to Sucre (via Potosi). Day Twelve – Copacabana – spend the night on Isla del Sol in Lake Titicaca. Day Thirteen – Second night on Isla del Sol, or a night in Copacabana. Day Fourteen – Cross the border and take the bus to Puno. If Diana prefers just to take the one day tour at Salar de Uyuni and spend one day less in Sucre, she can afford to take a bus from Sucre to Cochabamba and spend a night or two at the gorgeous Torotoro National Park – where she can hike, visit canyons, spot dinosaur footprints, and explore incredible caves. It was one of my highlights in Bolivia and is absolutely beautiful. From Cochabamba it’s an 8 hour bus ride (usually overnight) to La Paz. Alternatively, if she doesn’t like the sound of the mine tour, Diana might want to consider replacing Potosí with Tupiza, Bolivia’s “wild west”. A small town surrounded by towering walls of red rock and dusty brown mountains, this is a great area for hiking and horse riding, with rust coloured canyons dotted with bizarre rock formations and grey-green cacti. Perfect for lovers of the great outdoors, Tupiza is a fantastic adventure and a great stop on a short Bolivia tour. If you have any recommendations for Diana, or any questions about Bolivia, please leave a comment! Got a question you need answered about South America? Get in touch to be featured next time.